In addition to Indonesia's national holidays honouring Islam, Christianity, Buddhism and Hinduism, Bali has its own customs and rituals, based on centuries-old beliefs which have evolved into Bali’s own form of the Hindu religion. Visitors may be perplexed by the numerous street processions and the little offerings left at seemingly random places. Don’t be. Balinese have been carrying out their colourful ceremonies and customs without inconvenience to anyone for a long time. They are a rather passive race with a very active religion that encompasses everything the Balinese do; sometimes quietly, often very noisily. A basic principle of Hinduism is that the universe is structured - things do not happen at random, and it is essential that a balance is maintained between order and disorder. Spirits are everywhere and ultimately control nature, and so must be honoured regularly to maintain balance. 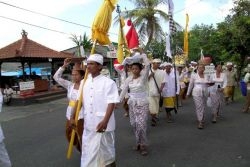 Rituals and festivals are the way that Balinese maintain this order. The festivals thus have great meaning and are an integral part of the Balinese culture. Balinese Hindus apply strict rules regarding temples and ceremonies. These rules mainly concern dress, physical conditions such as menstruation or open wounds, bringing food into the temple, being physically or mentally ill, being in a state of mourning (for the Balinese this lasts 42 days), and having given birth within the past 42 days. Always wear a sarong + sash - can be hired at temples. Do not flash or point your camera at a priest’s face. Never sit higher than the priests or the offerings. During cremation ceremonies, do not get in the way of attendees, however great that photo opportunity might be. Women are not allowed to enter temples during their menstruation. Top of body must be covered; no bikini tops, sleeveless dresses nor shirtless men nor singlets. Siwa Ratri, often referred to as the 'night of Siwa', is an auspicious time for introspection and meditation, during which the Hindus of Bali pray for forgiveness of their earthly sins and for support and strength from Siwa in order to reach their higher selves. The Siwa Ratri will begin with a morning prayer, typically ending at 6:00. Monabrata: not talking for 12 hours. Upawasa: not eating or drinking for 24 hours. Mejagra: not sleeping for 36 hours.The Siwa Ratri celebration also aims to overcome materialism and to be closer to God through surrender and prayer. This holiday is the Balinese New Year, called Icaka New Year - a day of total silence throughout the island. No activity, no traffic is allowed on the roads; no fire may be lit for 24 hours. Great purification and sacrificial rites are held on the day before, so as to banish evil spirits from every place on the Island - Ogoh Ogoh figures are built, then burned. This day is devoted to Dewi Saraswati, the Goddess of Science & Knowledge. Books of knowledge, manuscripts and the Wedas are blessed and special offerings are made for them. As with other religious days in Bali, there are also ritual activities before and after the day of Saraswati itself. The day before the Saraswati is called Pengeradanaan, a day to prepare for Saraswati both spiritually and physically. Books are cleaned and properly arranged. On Saraswati Day, the Balinese make offerings to their books. Students celebrate at school, usually in the morning. The Saraswati Day is not a day off work, so all offices are open. The day after Saraswati is called Banyu Pinaruh. "Banyu" means water and "Pinaruh" means wisdom. Taken together, the words mean that man must have wisdom which always flows like water, and is useful for mankind. Early in the morning of Banyu Pinaruh Day, people will go the beaches, rivers and springs to purify themselves and pray for wisdom. Pagerwesi commemorates the day upon which an ancient battle between good and evil was fought. The word "Pagerwesi" means "iron fence", and reflects the purpose of this important event: it is the day to strengthen one's fortifications against evil. The correlation between Pagerwesi and the Saraswati is that knowledge is so powerful that it must be protected from bad influences. Pagerwesi Day reminds people to be wise and more aware of the function and power of knowledge. One of Bali’s major festivals celebrates the return of Balinese gods and ancestors to Bali. For ten days, Balinese families will entertain and welcome with prayers and offerings, along with ceremonies to cleanse and balance the inner and outer energy of the island. Galungan features, among other things, barong dancing from temple to temple in the village. The festival symbolizes the victory of good over evil. The origin of Galungan is a mystery, but essentially it is believed to be the beginning of the week in which the gods and ancestors descend to earth, and good triumphs over evil. The holiday is celebrated by the fitting of 'penjor', tall bamboo poles beautifully decorated with woven coconut palm leaves, fruit, cakes and flowers, on the right side of every house entrance. People are attired in their finest clothes and jewels on this day. 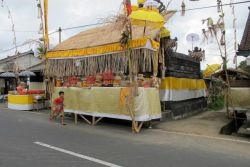 Three days before Galungan – on Penyekeban - families begin their preparations for Galungan. "Penyekeban" literally means "the day to cover up ", as this is the day when green bananas are covered up in huge clay pots to speed their ripening. Two days before Galungan - Penyajahan - marks a time of introspection for Balinese, and a time to make the Balinese cakes known as jaja. These coloured cakes, made of fried rice dough, are used in offerings and are also eaten, especially on Galungan. This time of the year finds a glut of jaja in every village market. A day before Galungan - Penampahan, or slaughter day - Balinese slaughter the sacrificial animals that will go into the temple or altar offerings. Galungan is marked by the sudden surplus of traditional Balinese food, like lawar (a spicy pork and coconut sauce dish) and satay. On Galungan Day itself, Balinese devotees pray at the temples and make their offerings to the spirits. Women are seen carrying the offerings on their heads, while men bring palm fronds. This festival is held ten days after the Galungan Festival, signifying the closing of the New Year holiday. On this day special offerings made of yellow rice and special dishes are offered; every family compound and temple looks amazing with ornaments. This is believed to be the ascendance day - when ancestral holy spirits and deities return to heaven.